We all need more wheat germ, oat bran, flax seeds, and coconut oil in our lives. 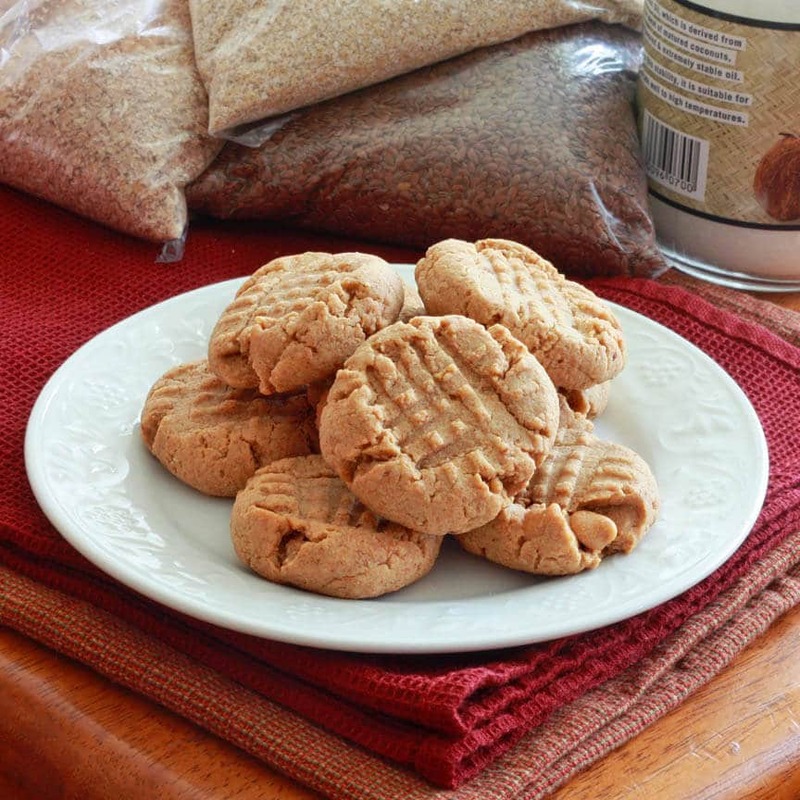 What you would call peanut butter cookies that incorporated all of these? Yes, I can well imagine some very unflattering names one could come up with based on this description. But you won’t hear any unflattering ones from me because I TASTED THEM! 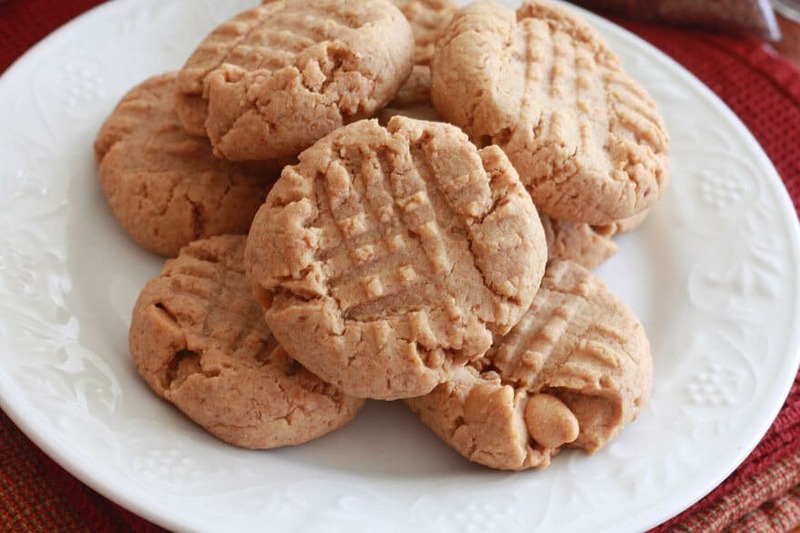 And let me tell you, not only are these peanut butter cookies mega healthy, they taste fantastic! Honestly, truly. I wanted to make some extra healthy cookies for my toddler. These cookies were totally experimental and I really wasn’t sure what the end result was going to be. I was so happy when I pulled them out of the oven. And even happier when I tasted them. Instead of butter or vegetable oil, I used coconut oil. Wow! It resulted in a cookie that has an almost melt-in-your-mouth consistency and a freshness that is a.m.a.z.i.n.g.. The wheat germ and wheat bran also helps lighten up the texture, adding a little more “airiness” to the whole wheat. The flavor of the flax seeds is completely camouflaged by the other flavors but adds lots of healthy omega-3’s. These cookies are low in sugar, contain healthy oils, and are bursting with fiber. While not overly sweet, the delicious flavor of the coconut oil more than compensates. For a ridiculously healthy treat that doesn’t compromise flavor, this cookie is a winner! Let’s break down the health profile of these cookies even further. But first, a disclaimer. 1) I am not a doctor. 2) These cookies will not cure you. Okay, now with any potential liability issues addressed, let’s continue on! Wheat Germ – a powerhouse of nutrients. It’s one of the best sources of folic acid, which has been linked to lowering the risk of heart disease, osteoporosis bone fractures, and dementia. It also contains a phytonutrient called L-ergothioneine, which is a powerful antioxidant. And then of course there’s the mega doses of fiber which helps in reducing cholesterol, cancer prevention, boosts digestive health, lowers blood sugar, provides relief for those with IBS, helps prevent kidney stones, helps reduce stroke severity and helps with stroke recovery, assists in weight loss, and improves skin health. So, you have two nutrient powerhouses working on your behalf! Flax Seeds – flax seeds have been cultivated since 3000 BC. Containing high amounts of health omega 3 oils, flax seeds are powerful nutrients in promoting a healthy heart. They have also been shown to reduce the risk of breast, colon and prostate cancer. Flax seeds also contain lignans, which have both plant estrogen and antioxidant qualities. Grinding up the flax seeds, as in this recipe, helps release all of these nutrients. Coconut Oil – not only delicious tasting, coconut oil provides many health benefits. It has been shown to increase the body’s resistance to viruses and bacteria that cause illness. It also helps fight off yeast, fungus and candida (more great words to include in a post about food!) It helps regulate and boost thyroid function which improves energy, metabolism, and endurance. It also helps regulate blood sugar, lower cholesterol, and improves digestion. It has also been shown to assist in weight loss, specifically tackling abdominal fat. And then of course there’s the whole wheat in these cookies, another good source of fiber, and the honey, which has been extolled by people for centuries for its powerful medicinal, antioxidant, antiseptic, and antibacterial properties. It’s not just that these cookies aren’t bad for you (no refined sugar or flour), they’re actually very good for you! 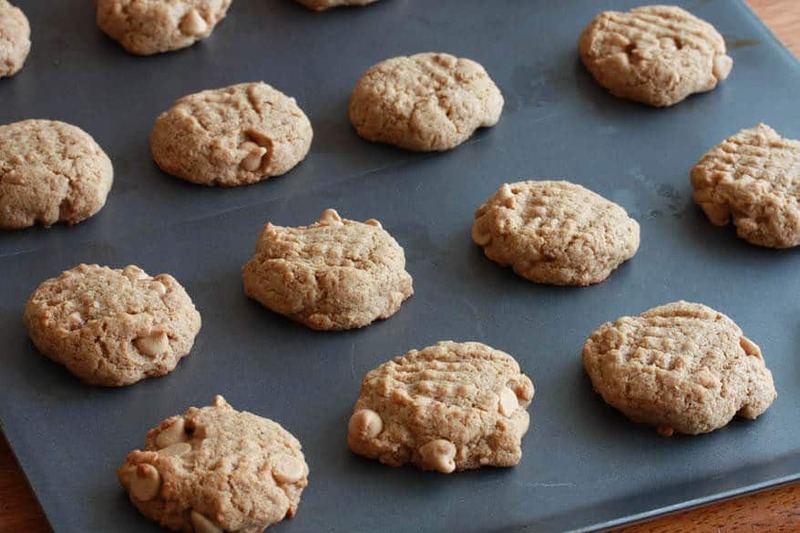 Mega Healthy Peanut Butter Cookies that are good for you and taste oh. so. good.! Eat without the guilt! How can you say no? P.S. Wheat germ and oat bran can be purchased in small quantities in the bulk sections of stores like Fred Meyer and WinCo. 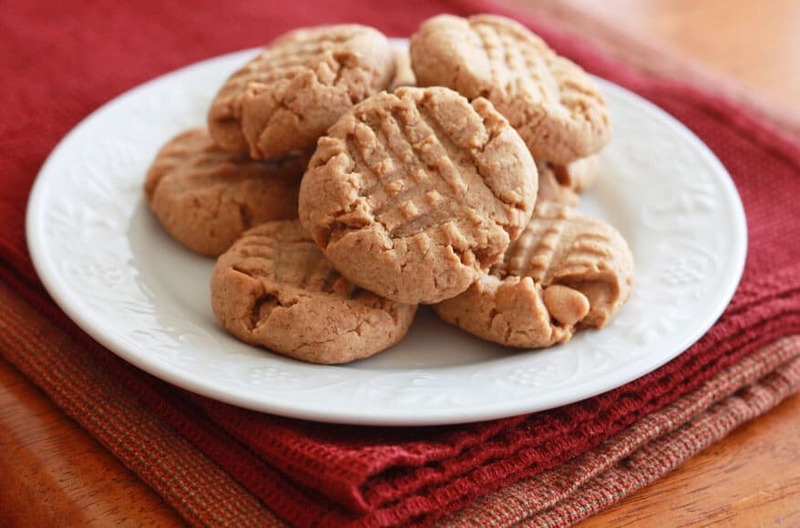 Okay, before we get to that super-duper-health-delicious peanut butter cookie recipe, please take a moment to “Like” The Daring Gourmet on Facebook so you’ll never miss a recipe! Combine all the dry ingredients, except for the peanut butter chips, in a bowl. Set aside. Beat the coconut oil, honey and peanut butter until combined. Then add the eggs and vanilla extract and beat until combined. Add the flour mixture to the wet mixture and beat just until combined. Do not over-beat. 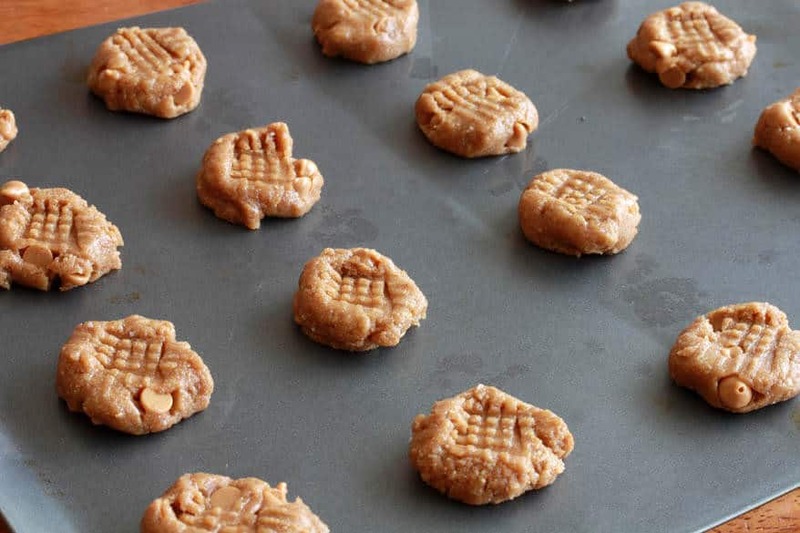 Put the cookie dough on a nonstick cookie sheet in 1-inch rounds. Press the cookies down with a fork in criss-cross fashion. Bake in an oven preheated to 350 degrees for 8-10 minutes or leave in longer for a firmer cookie. 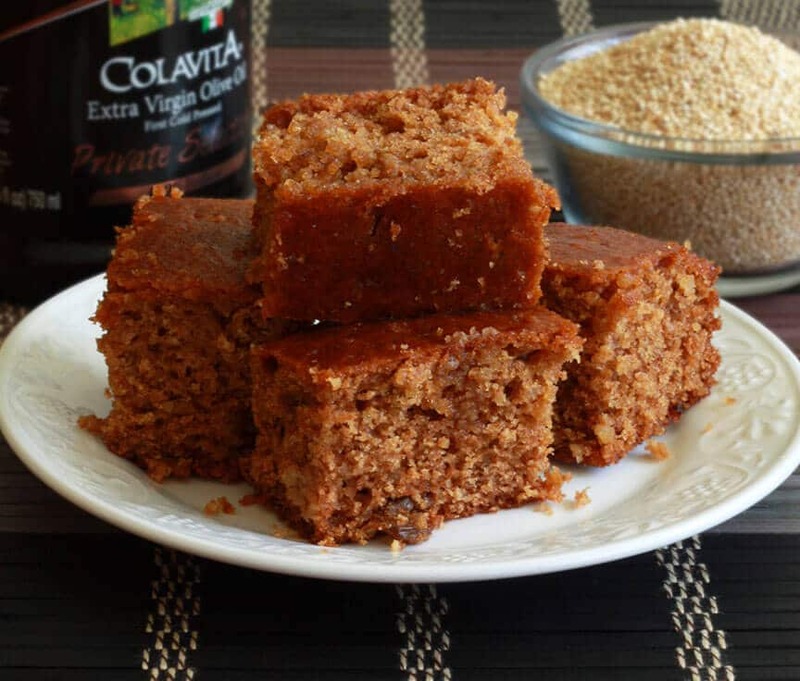 Mega healthy fans, also be sure to try this Mega Healthy Honey Olive Quinoa Cake! You’ll love it! These cookies have an almost melt-in-your-mouth quality to them and the flavor of the coconut oil is divine. In a medium mixing bowl, cream the solidified coconut oil, honey and peanut butter together until smooth and creamy. Add the egg and vanilla and beat for another minute. 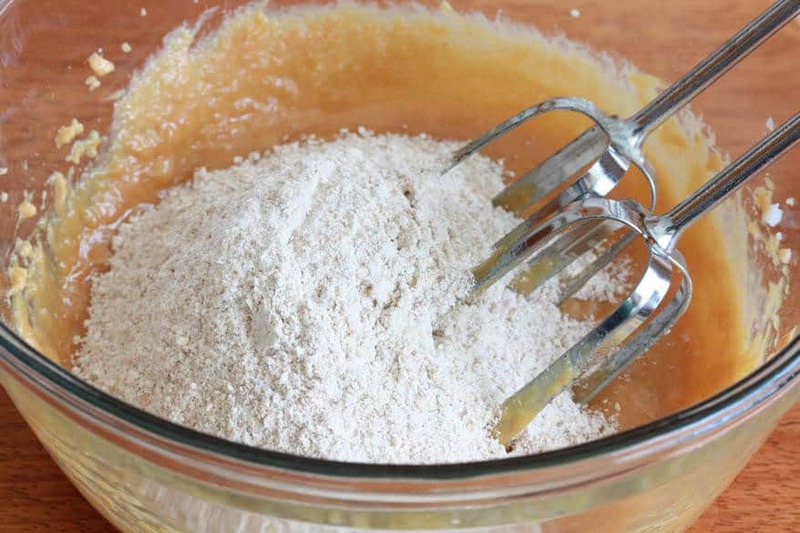 In another bowl, combine the flour, salt, baking soda, and baking powder. Stir in the wheat germ, oat bran, and flax seeds. 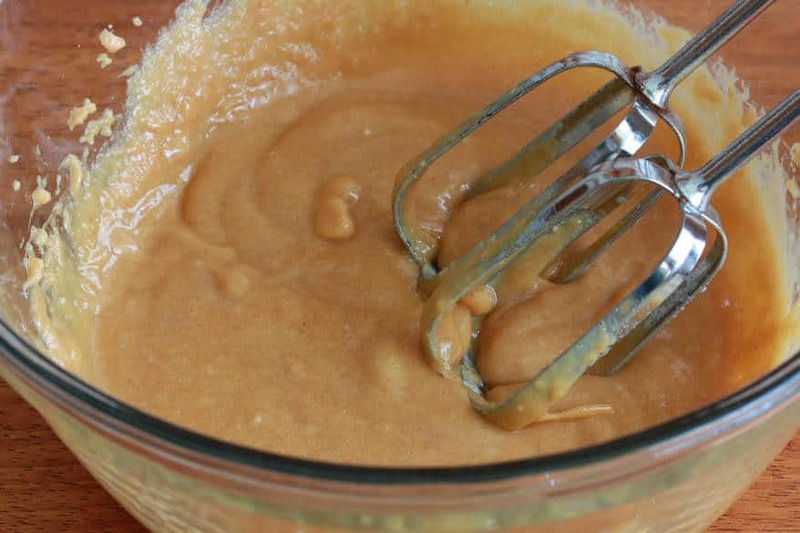 Gently stir the flour mixture into the peanut butter mixture, stirring just until combined. 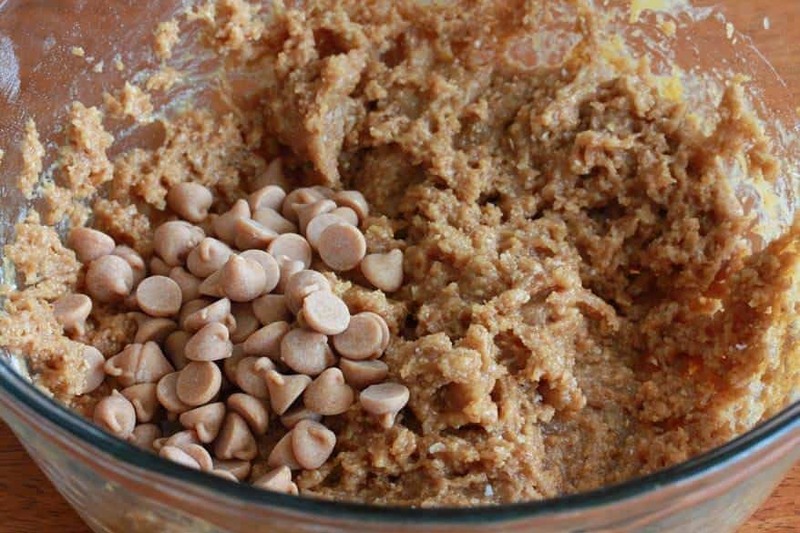 If using, stir in the peanut butter or chocolate chips. 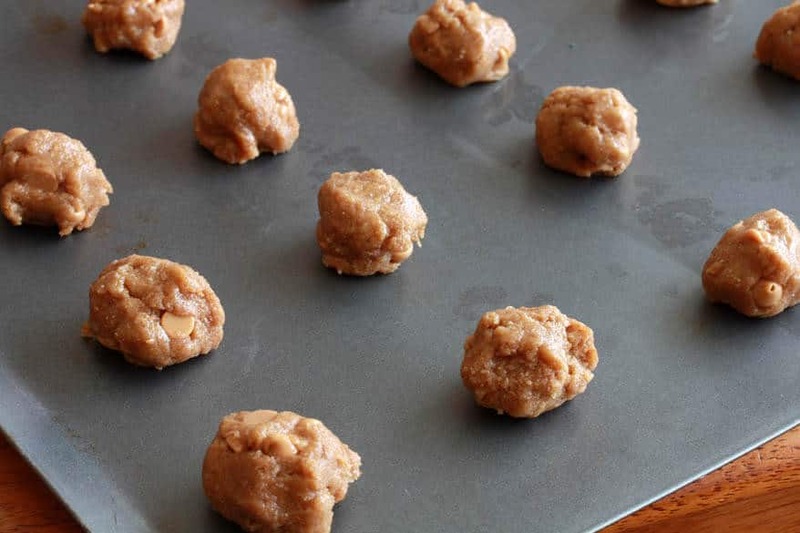 Form the dough into 1-inch balls and place them on a cookie sheet about 2 inches apart. Press down on each ball with a fork to create a criss-cross pattern. Bake for 8-10 minutes. Remove from the oven and allow to cool for 5 minutes before transferring the cookies to a wire rack to cool completely. Awesome! Let me know what you think. You can purchase small amounts of wheat germ and oat bran in the bulk sections of stores like Fred Meyer and WinCo. I was thinking the exact same thing Candy. I like peanut butter cookies so much! I’m LOVING all the healthy ingredients packed into those cookies. They sound delicious! Thanks, Ruta! “Packed” is right! I really wasn’t sure how they’d turn out and am so happy with the results. I made these a few days ago and LOVED them! I’ve been hoping for a cookie that doesn’t make me feel guilty every time I swipe one for an indulgent treat, and here it is! Thank you!!! Yippeeeeeeee!!! You’re the first person who’s gotten back to me about making these! You know, I was a little nervous because any time I create a recipe I write down the ingredients and quantities I’m adding as I’m going along. Well, my 1 year old ATE my post-it note with the recipe!! (Well, ate part of it and mangled the rest ;) Likely excuse, huh? But it’s true! I panicked and sat down to type up the recipe, hoping I was remembering everything correctly. I’m pretty sure I did. And you’ve confirmed that they turned out okay, so yayyy!! They really are great cookies. Not too sweet, but I love the coconut oil flavor in them. Such a refreshing taste. And I really enjoy the almost “melt-in-you-mouth” effect these cookies have. Eat away! Without all the guilt! Just made these tonight and they are FANTASTIC! I have recently made the switch to no processed foods and I have really missed making cookies so this recipe was perfect. My very picky 13 year old son ate one and then asked for more! This is definitely a keeper!! YES!!! Thanks so much for your feedback, Kristen. If a picky 13 year old enjoyed these, that’s probably the biggest testament of all! :) For another successful and deceptive ruse, you should try the Chocolate Deception Cake ;) 100% whole wheat, honey, buttermilk and 2 whole cups of zucchini! Just wondered if I made a mistake along the way. The dough was more like cake dough so could not form into balls, just had to drop them onto the cookie sheet? Hi Dave! Was the coconut oil solidified and did you use natural, unsweetened peanut butter (which has a different consistency than the sugary stuff)? Did the cookie dough sit on the counter in warm temperature for a while before using? my dough was like cake dough also. Very wet. I thought I used solidified coconut oil. It was all that i could find. It was in a glass jar and was hard when i took it out. Hi Linda, I’m so sorry to hear these didn’t turn out for you. The dough is supposed to be quite soft, but not as wet as you’re describing. I’m not sure what could have gone wrong. Yes, it sounds like you used the correct coconut oil – just be sure it’s still solidified when you add it to the recipe as coconut oil melts very quickly in warm temperatures. Did you use natural, unsweetened peanut butter? It has a much firmer consistency than sweetened. Also, natural unsweetened peanut butter has a ton of oil in it and needs to be thoroughly stirred, otherwise you’ll end up with too much oil in the batter and it will be too wet. Mine were very soft when they came out of the oven and I think it’s because I used a soft peanut butter. As they set on cooling racks and even until the next day they stiffened up. I bet yours will still be super yummy! Thanks for the input, Susan. If I’m remembering correctly, I think mine were very soft right out of the oven too and then got firmer once they were cooled. I changed a few of the ingredients according to what I had in my pantry but kept the wet/dry ratio the same. I was a bit worried about how oily the dough was but the cookies turned out great! Very moist and soft. Thanks for making the cookies and for your feedback, Ari! I can’t wait to try these! Any idea of what the calories might be per cookie? Hi Lisa! That’s a good question! I just tallied up the calories. The entire batch of 20 cookies has about 2700 calories (not including the peanut chips, which are optional), which comes to about 135 per cookie. A whole 1/3 of the total calories are from the coconut oil, which has interestingly been shown to help burn fat and assist in weight loss. A good portion of the other calories are from crude fiber, which also assists in weight loss. And the majority of the carbs in these cookies are complex carbs which are much better for you and much slower to convert into glucose in your body. Still, while I wouldn’t promote these cookies as part of a weight loss regimen (though if I were to indulge occasionally while dieting, these would be it! ), it is important to consider the source of the calories rather than just look at the caloric number itself. Not all calories are created equal :) In terms of healthy eating and healthy sweets, these cookies are packed with a ton of goodness. Let me know what you think when you’ve tried them! I just made these, because it is a little cold here this weekend and I have been looking for a treat to make for my husband before we are in to bbq only weather. I am so impressed! The cookies really hold their shape, but melt in your mouth, and they have just the right amount of sweetness to feel like a treat. Thanks so much for sharing your recipe. I will definitely make these again! Would the cookies turn out ok if you were to use only 1/4 cup of coconut oil? Or would applesauce substituted work? Just trying to see if there are any tweaks I can do to make them closer to 100 calories each. They sound good though and I look forward to trying them! Hi Austin! You know, I don’t know! I already consider it pretty miraculous that they hold together so well as is. Using half the amount of coconut oil would render them too dry – probably wouldn’t hold together. You could try using 1/4 cup coconut oil and 1/4 cup applesauce so there’s more moisture. How that will turn out I’m not really sure. Eliminating the coconut oil altogether will remove the fantastic flavor of these cookies as well as the “melt-in-your-mouth” quality (and some of the health benefits). If you go with half oil and half applesauce, let me know how they turn out! Just made these with what I had on hand..Loved them by the way.. I had creamy Skippy peanut butter, so I used 1/3 c. coconut oil. That was my only change. The dough was very oily, but baked up real nice and soft!! Thank you for posting a relatively healthy cookie recipe! I have a problem with white sugar so this fits!! I’m happy you enjoyed these, Trinity! They really do have a great texture and flavor. Thanks so much for your feedback! These were amazingly delicious! My family loved them and I ate three straight out of the oven! Thanks for the healthier version without all the butter! Yummy! 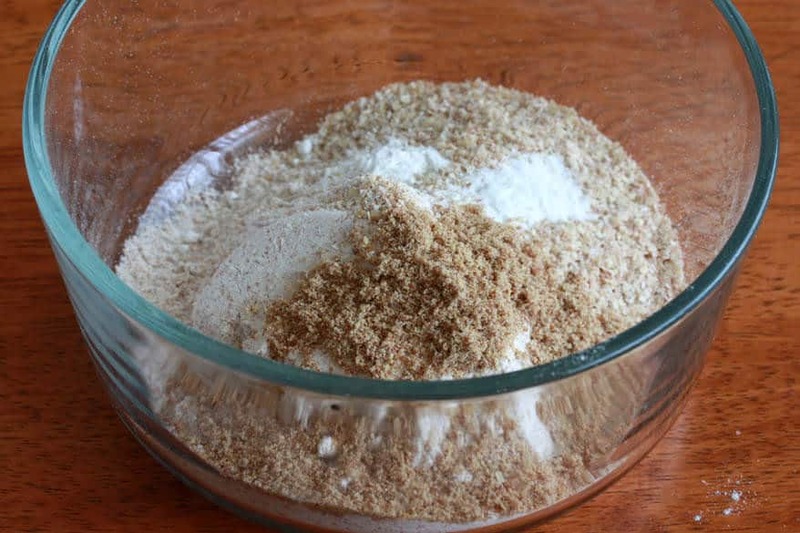 So I want to make these now while baby sleeps…without a store run….if I have no oat bran, flax or wheat germ do you think I can just replace with whole wheat flour? Hi Michelle! Thanks for the compliment! :) The bran and germ are very light as opposed to the dense whole wheat flour. They create a lighter, more porous texture in the cookies. I wouldn’t recommend a direct substitution with flour. If you’re going to omit those ingredients, just add an extra tablespoon of flour – no more. The texture of the cookies will be greatly altered without the other ingredients, but will still taste basically the same. Thanks so much for this recipe! Makes me grateful for google (searched peanut butter, coconut oil and oat bran). I just made them and they taste wonderful. My substitutions were rice malt syrup for the honey, and instead of whole wheat flour I used 1/3 cup vanilla protein powder and 2/3 cup wholemeal spelt flour. This recipe is a keeper! That’s wonderful, Michelle! I’ve been experimenting with some other insanely healthy dessert options – more keepers to come :) I’m so happy you’ve found my site and hope you’ll be a frequent visitor! I look forward to checking back! Happy experimenting! these are SO tender after baking I can hardly move the cookie off the rack, any suggestions to toughen it up? Hi Lara! Depending on the elevation of where you live, you may need to bake them a little longer. Also be sure to use a good non-stick cookie sheet or make sure it’s adequately greased, that way the cookies will be able to come off easily. Let them cool on the cookie sheet for at least 5 minutes before transfering them to the cooling rack. They are really soft right out of the oven, but will firm up nicely once they begin to cool. Hello, Mary! I’m so happy to hear you liked them! No, I don’t have the nutrition info available for my recipes. There’s a site though that I like that allows you to plug all the ingredients in and their amounts and it will generate all the nutrition info for you: fitday dot com. Heidi, I’m thrilled to hear that!! I’m surprised to hear it’s so difficult to find wheat germ where you are, but the sunflower seeds and almonds are a great, and healthy, substitute. As to the peanut butter flavor, you can definitely experiment with adding a little more and just increase the dry ingredients accordingly. Thanks for your feedback! I found the Wheat Germ in the Cereal aisle in my grocery store. Perfect! Glad you were able to find it, Richard, and thanks for the tip. I just recently saw Bob’s Red Mill brand of wheat bran in the health food section as well. Delicious and my 5 year old twin boys love them too! They asked if they could hide them so no one else eats them! Thanks for the recipe! That’s wonderful, Mellisa! So happy they were a hit, especially with your little guys! Thank YOU for making them and for taking the time to leave feedback! I just made these, but substituted almond butter for the peanut butter and they turned out great :) My 4 year old and twin one year olds like them! Fantastic, Petra! I just made another batch of these last week as well and my little ones gobbled them right up, too :) Thanks so much for your feedback! These are fantastic. I already grind my own wheat grains for the nutritional value ( much better than store bought) and I’m always looking for healthier options for dessert. I couldn’t find my flaw seed so I just used additional freshly ground flour. My coconut oil was soft since my house was warm so I added a few handfuls of oats (to make it less mushy) and substituted chocolate chips for the peanut butter chips. Next time I’ll also add a little coconut. Great recipe, I’m putting it in the books! Excellent, I’m happy to hear they were a hit! It’s a great recipe for customizing according to personal preferences and I like the addition of the oats. Grinding the wheat berries for freshly ground flour is fantastic! Thanks so much for your feedback, Kristi! I made these cookies three days ago and My husband (The cookie Monster) Said they were the best peanut butter cookies he’s ever eaten! Thank you for sharing this recipe! My husband has cancer and I know that sugar it not good for him, but want to keep indulging him with his favorite treats. I am doing my best to change the way we eat and it’s good for me too, since I need to want some weight. Now to the recipe; I used 1/2 cup of honey because my sweetheart has a sweet tooth. I used 2 tsp of vanilla becasue we love the vanilla flavor, I did not use wheat germ, but used 3 tbs of oat bran and I did use the peanut butter chips. It’s been extremely hot here and the afternoon I made the cookies I believe it was close to 100 outside, although I had my air on in side.I believe that was why my dough was very soft, not liquid but too soft to scoop. I put my bowl in the fridge and covered it with a damp napkin for about 20-30 min. After I took it out I was able to scoop it and form the balls for the dough. In my oven I baked them for 13 min. The bottoms were golden brown and just beautiful and delicious! Hi Julie, I’m delighted to hear that you both enjoyed them! We’re all big fans, too. 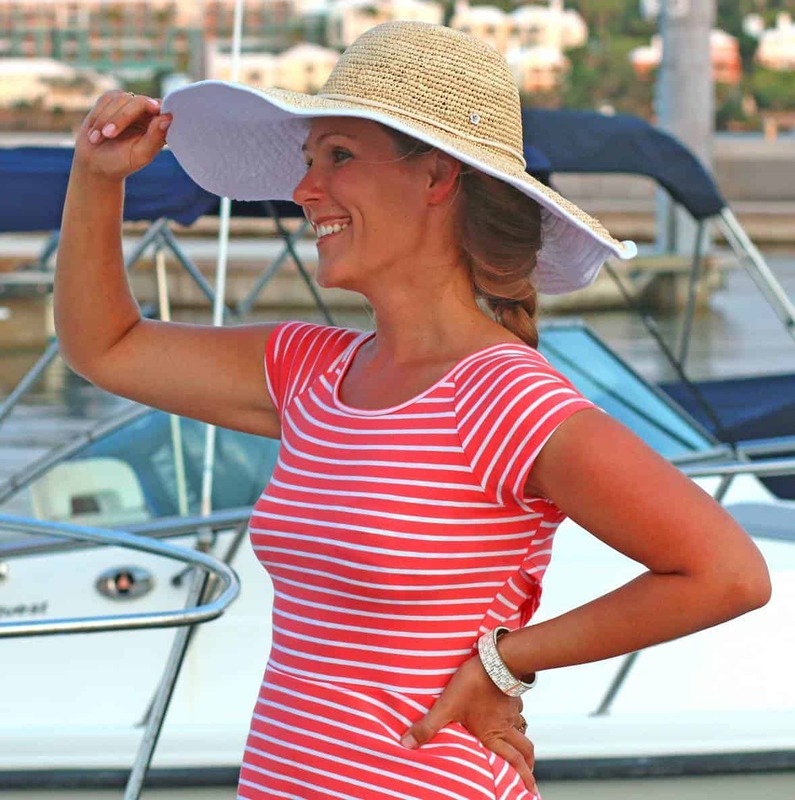 Thanks so much for the feedback and your hot weather troubleshooting tips! Hi Elizabeth, sorry to hear that! Of all the feedback I’ve gotten via comments and emails, about 95% report success while there have been a couple, like yourself, who report some challenges with the consistency of the dough. It might be helpful if you read through the other comments for some troubleshooting tips (e.g., consistency of the coconut oil, using the correct peanut butter and all other ingredients, baking the dough immediately vs. letting it sit out first, letting the cookies cool completely before moving them, etc). Happy baking! Hi Lori, the entire batch has about 2700 calories which breaks down to 135 calories per cookie (if you’re making 20 cookies). 1/3 of those calories are from the coconut oil alone, so a very healthy source of calories (in fact, coconut oil has been shown to assist in weight loss ironically). How would I use PB2 instead of peanut butter in this recipe? Hi Ashley, I’ve never used PB2 so I’m afraid I can’t make any recommendations on how to use it as a substitute in this recipe. This recipe is amazing! I tweaked it a bit for my kid and I just want to tell you that these cookies are so good! I substituted black-strap molasses for the honey, and used virgin coconut oil, Justin’s Honey-peanut butter, and did 2 TBS ground red flax and 1-1/2 TBS hemp seeds OMG OMG I have to go get wheat and oat bran for the next batch.. but you know!! Big hit over here.. Thank you for sharing!! I just made these – followed the recipe to a tee ‘except’ I used brown rice flour. The cookies came out well formed, really nice and soft, but unfortunately pretty dry on the first batch. Second batch I added a tad bit more coconut oil & peanut butter. They were a bit better, still dry. I’m guessing it’s the brown rice flour – but, I thought it was close to wheat flour in consistency. ~ Thanks for sharing, healthy ingredients!! Hi Laurie! Well, because of the ingredients that packed in these, they’re not what I’d call “moist” cookies anyway. But absolutely yes, brown rice flour has a way of soaking up moisture like crazy. I just made a batch of cookies the other day using brown rice flour and they were much drier than they are when I make the same cookies with whole wheat flour. Gluten free baking requires other adjustments and unfortunately it isn’t always as simple as making a direct substitution of flour without altering some of the other ingredients as well. Must these cookies be refrigerated because of the wheat germ and oat bran? If not, what is their shelf-life? Hi Serena, no they don’t have to be refrigerated and their shelf life is the same as any other homemade cookie – most recommend 2-3 days outside the fridge and up to 2 weeks in the fridge. Much longer frozen. These cookies spread out into one big pancake on my cookie sheet! :(. Are you sure the dough shouldn’t be chilled first? Oh no! Was your coconut oil solid when you used it or liquid (it needs to be the former). I’m not sure why that happened, Amanda, that’s the first time I’ve heard of that happening. No, the dough does not need to be chilled first. Amazing flavor, though! I’m hoping that they harden up as they cool. Yes, they’ll harden as they cool but they shouldn’t have turned into a pancake, agh!